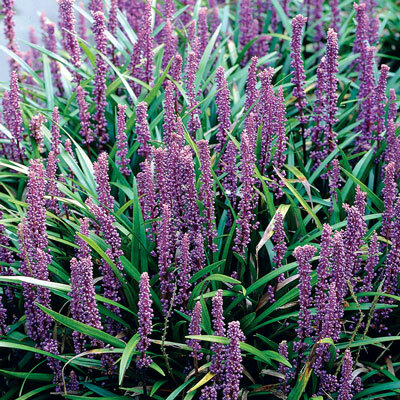 Big Blue Liriope | Henry Field's Seed & Nursery Co. In late summer enjoy pretty lilac-purple flowers resembling grape hyacinths. Blooms are followed by blue-black, berry-like fruit. 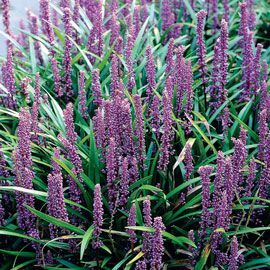 This clump-forming variety has wider leaves and larger flowers than Liriope spicata. Good choice for ground cover, containers, edging or an accent plant. Grows 12- to 18-in. tall. Prefers light shade. Zones 5-10.Bareroot. Height 15 - 20 inches. Spacing: 15 - 24 inches. Foliage: Tufts of slender grass-like leaves. 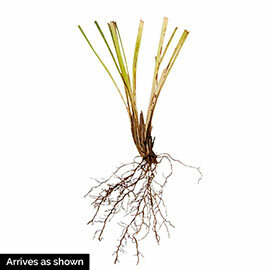 Form: Evergreen perennial. Mounding/Fountain like habit. Flower Form: Small spikes of blooms resembling grape hyacinths, but much smaller. Soil Requirements: Tolerant of wide range of soils except extremely wet. Pruning: Cut back or mow down in the spring if the foliage has discolored over the winter. New growth will appear quickly.